You hear it all the time: you need to do cardio to protect yourself from heart disease, burn calories, and lose or maintain your weight. But “doing cardio” doesn’t have to mean hopping on a treadmill to log your required minutes – how boring is that? The whole point of cardio is to place a moderate amount of stress on your heart and lungs so that they’re challenged enough to make beneficial physiologic adaptations to support the higher level of physical activity. But how you choose to place stress on your heart and lungs is up to you. As long as you keep your heart rate up during your workout, there’s no reason you can’t punch, kick, and jump your way to a healthy heart at your local boxing gym. All that punching, kicking, and jumping requires a surprising amount of strength. Think about it – most professional heavy bags weigh at least 100 pounds. During a boxing workout, you may punch or kick a bag hundreds of times, requiring your upper body, lower body, and core to engage as you make contact with the bag. Plus, most boxing gyms incorporate other strength training moves into a boxing workout. You may not think about the importance of hand-eye coordination and its affect on total health, but hand-eye coordination plays an important role in a person’s gross and fine motor skills. Individuals with good hand-eye coordination tend to have faster reflexes and reaction times, and tend to have better physical coordination as a whole. This is particularly important during aging, as coordination and balance become compromised, increasing the risk of falls. 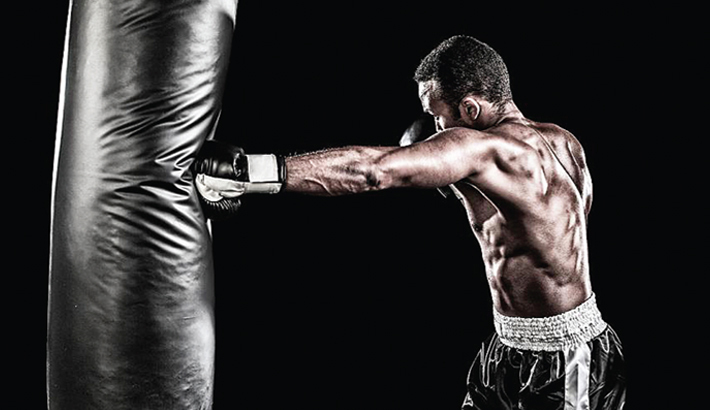 Boxing can help hone hand-eye coordination. When you’re tasked with punching a speed bag or you’re paired up to spar with a partner, you must be able to see the target, react to the target, and hit the target, all while the target is moving and changing position. It’s tough, but with practice, your hand-eye coordination improves substantially. Almost any form of moderate to intense physical activity can decrease stress. Exercise increases endorphins, boosts mood, works as a form of meditation, and improves sleep, all of which help reduce stress. Boxing is a great outlet for stress for two reasons: first, during a boxing workout you typically move between high intensity bouts of exercise and moderate intensity recovery periods. When you’re pushing yourself through a couple minutes of high-intensity punching or kicking, you don’t have much mental power left to worry about how awful your job is, or how dirty your house is. And even during rest periods, you’ll be focused on sucking wind and mentally preparing for the next round, not stressing over your packed schedule. Second, there’s an incredibly cathartic release when you get to take some of your stress out on a punching bag. It’s an empowering feeling to punch your stress to smithereens.